On a bright sunny and warm August day in 1987 I held my tiny 2 week old baby daughter close to my chest as my breath was stolen away by the RAF Red Arrows zooming in from the west to swoop over the air field at Baldonnel. I could feel the noise and the speed right through to my bones. I had never experienced anything like it. In 1987 Ireland was a very different place and with ‘the troubles’ ongoing in the North of Ireland and so the Arrows didn’t land on Irish soil. They flew in from RAF Valley in Wales and having thrilled us with their display of precision flying, they tore back across the Irish Sea again. It was probably the first time an RAF flight had officially crossed Irish airspace since the days when Baldonnel was itself an RAF base. The next time I saw the Red Arrows was again a special occasion. They displayed at the Galway Air Show on the 26th of June 2005 – which also happened to be my mother’s 70th birthday. My mother is a bit of an airplane nut. She loves airshows – even the more pedestrian ones. But she is a huge fan of the Arrows. So what better way for us to help her celebrate her big birthday than to decamp for the weekend to Galway and enjoy the aerial acrobatics of the RAF’s finest? The airshow was great and the Arrows gave their usual brilliant performance. Afterwards we returned to our hotel to get ready for mother’s birthday dinner. We arranged to meet in the foyer at 7pm for drinks. So there we all were, gathered in our finery, awaiting the arrival of the birthday girl when the lift doors opened and out she stepped...... flanked on each side by a Red Arrow. Yep, one on each arm, resplendent in their red jumpsuits. I am sure mother was dressed to perfection but I only remember the enormous smile she wore as she floated towards us. By the time we had all closed our mouths, the arrows had gone. Mother was still hovering above ground as we sat armed with our meagre presents knowing that we could never match the gift the Red Arrows had just bestowed on her. As we regained our composure, attention turned to my poor husband who is a professional photographer and who was so stunned he forgot to pick up his camera to capture the moment. He was mortified. He disappeared. We ordered drinks and listened as mother babbled on excitedly about how charming and handsome the fliers who were her escorts were. Next thing the photographer reappeared and ordered mother up to her feet. He bore her away and the result is the photo above. The Red Arrows were having a private reception in another part of the hotel but readily agreed to pose for a picture with mother when the photographer admitted his failure to get a picture downstairs. This photo which they all later signed is one of my mother’s prize possessions. She moved a family portrait in her hall in order to give it pride of place! I recount this story now because two weeks ago the Red Arrows were displaying at the Bournemouth Air Show and one of their aircraft crashed. The pilot was killed; some believe this was perhaps due to his staying with his aircraft in order to direct it away from nearby houses. If true, this would not surprise me. 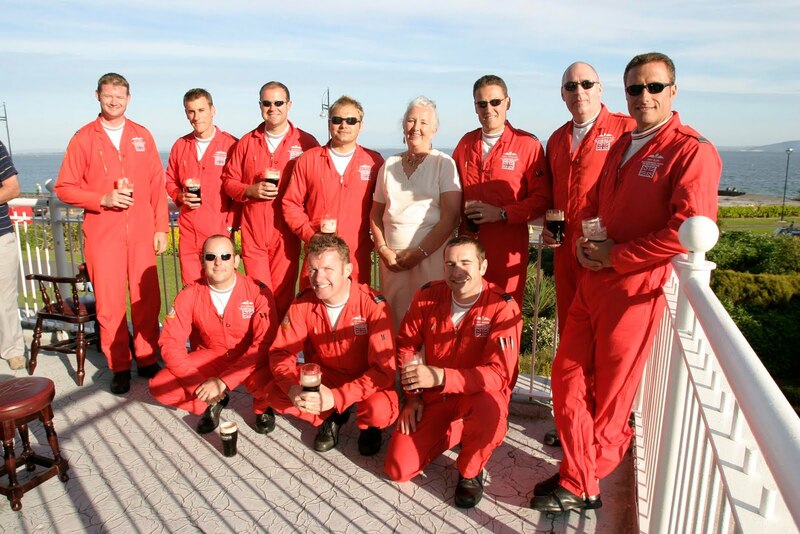 The pilots we met in Galway 6 years ago were gentlemen and they made my mother’s 70th birthday one she will never forget. Oh and this weekend the mother is off up to Portrush in Northern Ireland for their annual airshow which promises Vulcan’s Tornedos and F16 – mother will be delighted! Air heavy with the sweet tang of salt and seaweed. Riotous hedgerows bursting with orange crocosmia, creamy pink honeysuckle and purple thistle heads. Splashes of red fushia buzzing loudly as unseen bees do their work. A lone cow stands upon a rocky outcrop. Water softly lapping and slapping seashore stones. Of cloudscapes like celestial cities. Reflected perfectly in the still water below. The horizon folding the image at its centre. Twenty minutes later a burst of yellow sunshine. Hidden religs – uneven fields of bones and raggedy assemblies of holy relics and plastic flowers. Agus an Gaeilge – beautiful guttural sounds gurgling in the throats of local men in the fields. And the Connemara light, especially in evening, as the sun dips below the horizon on this western edge of Europe. On Saturday we will be packing our Maggie's bags and baggage and dropping her back up to the wonderful people in the DSPCA, from where we hope she will be adopted quickly to her new forever home. Our work is almost done. As you know from my previous post Maggie was one of the wildest and most frightened little cats I have ever encountered. It took us 2 days to coax her out from under our sofa. Then another day or two to get her to start (very gingerly) to play with some feathers on the end of a stick. It's been one small step at a time and has been a team effort in this house, to finally gain Maggie's trust. We have taught her that humans can be her friends and I hope that none of our species undoes that lesson. We had a secret weapon in our 'taming' of Maggie and that was Simba (fatcat). I don't want to take from the great credit due to Simba for playing his part but we all know that he was highly motivated by sharing Maggie's dinner which came in jelly and is clearly a lot tastier than the cat biscuits he usually has. But it was amazing to watch Maggie relax almost immediately Simba arrived into the room. Animals never cease to fascinate me. The first week we had Maggie was difficult. It required huge patience and I did worry that perhaps some cats are just wild and not tameable. But the joy in watching this little scaredy cat slowly make friends with us and learn the joy of being petted and sit on a knee is sublime! Really. The August Bank Holiday weekend is the last hurrah of summer – next stop Halloween and sure then it’s Christmas. 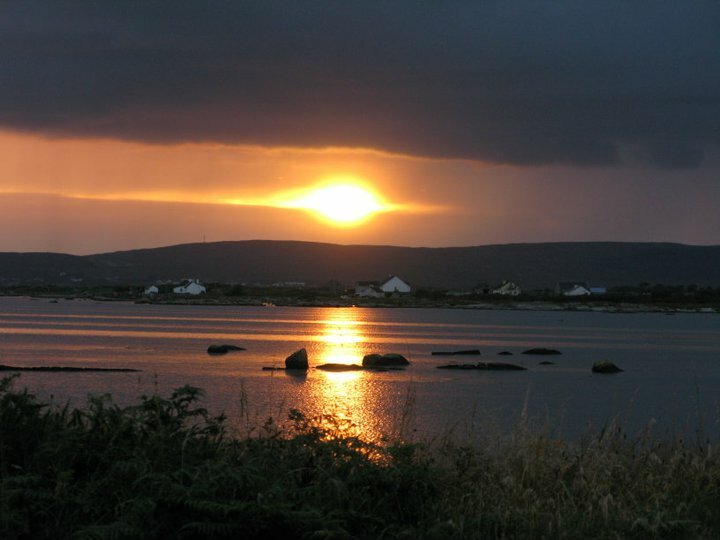 According to the Celtic calendar we are now in autumn and the August Bank Holiday roughly coincides with the ancient festival of Lughnasa, which marked the end of summer and beginning of the harvest. So how was it for you? Were you away? Did you have fun? What’s that? Me? Did I enjoy my bank holiday weekend? Em, well, em.... it was busy and eh, different! It is not the first time I have wondered what personality defect I have that insists on throwing complications into my life when things are chugging along just fine. 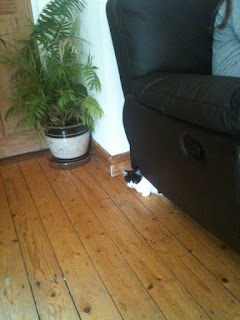 Regular readers of my blog will know that just over a week ago we fostered Hector from the DSPCA. Hector was only with us for 4 days and unfortunately was very unwell and had to be put down last Tuesday. So we were in mourning for him for a week but as we love animals and like to do our bit for their welfare, we offered our services again for fostering another kitten! So having welcomed a new student to our home on Sunday, on Monday off we went to Mount Venus Road to collect our latest project. 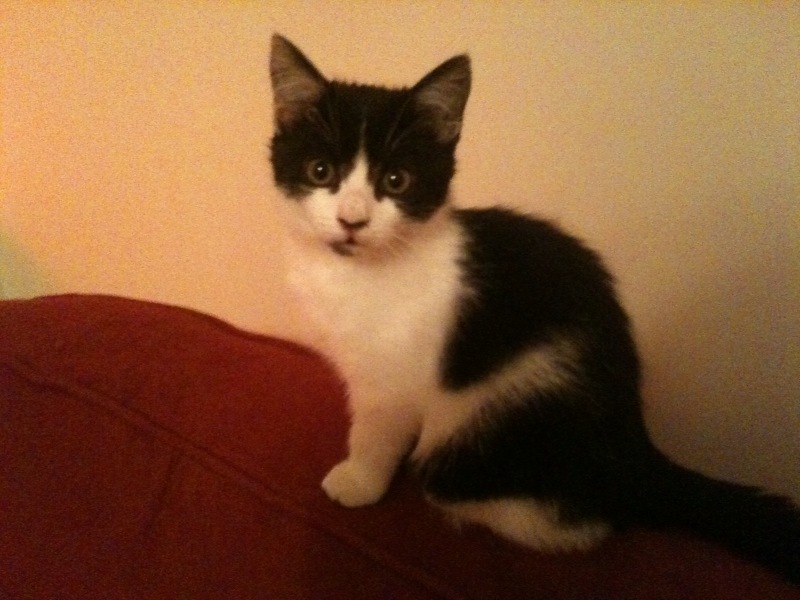 We were told that this kitten was in need of socialisation for two weeks and was approximately 12 weeks old. Maggie was clearly a nervous kitty but seemed OK in her crate as we gingerly carried her to the car for the journey home. We set Maggie up in the kids TV Room which is bright and has a view of the road. We thought that she might like to watch out (cats love looking out windows – did you know that?). I took the lid off her cat box and braved her spitting at me to pet her very gently on her back. She spat and hissed and I gently continued, trying to reassure her in a low soothing voice. Meanwhile Dylan da Dog was exploding with excitement in the hall and started banging the door down. I got up slowly and went out of the room leaving Mia with Maggie. As soon as I was gone, Maggie apparently darted out of her box and under the sofa. And that is where she spent her bank holiday weekend. So me, where did I spend my bank holiday weekend? Well most of Monday I spent feeling like a failed foster mammy, as I lay on the floor with my bum in the air as trying to understand why I could not see Maggie under the sofa. We then worked out that as the sofa was a recliner, she had climbed up into the innards where she was perched on one of the bars. So we were all afraid to sit on the sofa in case we inadvertently decapitated her. Hours passed as I tried to talk her out. In the end my eyes hurt from the dust (you should never look under the sofa) and I had a sneezing fit which did nothing to ease kitty anxiety. Our poor bewildered student who speaks very little English arrived home to find dinner late and her host covered in dust with a red nose from all the sneezing. I did my best to explain about the kitten in the sitting room and how she was welcome to go into the room but to make sure doors were left closed and to not sit on the sofa! A look passed over her face as I am sure she fought the urge to phone Mama in Lyons to report that her Mammy in Dublin was a nutter with delusions of kittens in the sitting room! By Tuesday we had decided to adopt a patient approach. My girls asked me endlessly what if she never came out? “Em, I replied” I guess we would have to phone the DSPCA for help.” I had visions of my sofa being ripped apart in order to retrieve Maggie from its bowels. I will admit that I was slightly worried. I will admit that I did call on St Francis for some help. That evening I had a small brainwave. We are the slaves to four cats already. The largest of these moggies is called Simba (or more usually FatCat) and he has brought disgrace on our family on more than one occasion. He has attacked Granny when she was calling in to feed him while we were away. The blood stained trousers were kept as a souvenir of his occasional lapse in how to be a good domestic cat behaviour. When the girls were younger their parties were fraught with danger. Simba generally had to be locked in the utility room for the duration from where he howled the house down – scaring the life out of the little girls of a more delicate disposition. We tried behavioural therapy under the supervision of the vet who suggested feline valium in order to teach him to relax. I was instructed to give him quarter of a tablet once a day for three weeks leading up to a particular party by which time his behaviour should have been adequately modified. I don’t know if you have every tried to quarter a valium but it’s well nigh impossible. Having festooned the kitchen floor in valium shards and having nearly sliced my finger off in the process, I gave up. We decided to give Simba a valium on the day of the party. It worked a treat. He slept through all the festivities, albeit snoring loudly and with his tongue hanging out. He remains a cat I love dearly but whom I cannot trust especially with older people or small children. I have been known to sprint out the front door because he has wandered in the garden and is 'making friends' with an elderly couple or a young family with toddlers. "Sorry" I mutter under my breath "he is not allowed talk to people" as I struggle to lift his bulk and transport him back indoors. His teeth haven been filed and his nails kept short in order to reduce any possible damage!!! However Simba is the only one of my four kitties who welcomes stranger cats into the house. 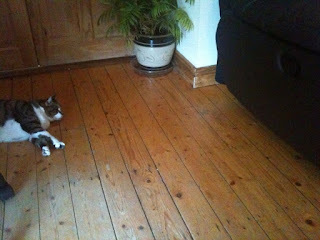 So – back to the original story here (keep up) – I decided on Tuesday that I would bring Simba into the sitting room in an attempt to show Maggie how (nearly) domesticated cats behave. Simba understood the brief exactly. He identified the sofa as being Maggies hiding place and lay on the floor emitting “it’s so relaxing here” vibes. It worked. After about 15 minutes a little black and white head poked out from the edge of the sofa. It took about an hour for her to come out fully and then she was always alert and would race back to the sofa at any movement or sound. But this was progress. So Maggie has started her rehabilitation from wildcat to domestic moggie! We have a long way to go .... I will keep you updated!